These biopharma stocks have great prospects and can be purchased today at attractive prices. You know what makes long-term investing even sweeter? Buying great companies at great prices when their shares are on sale. When the opportunity presents itself, moving in at the right starting price can make all the difference for buy-and-hold investors, especially when that gratifying force of compound interest is factored in. 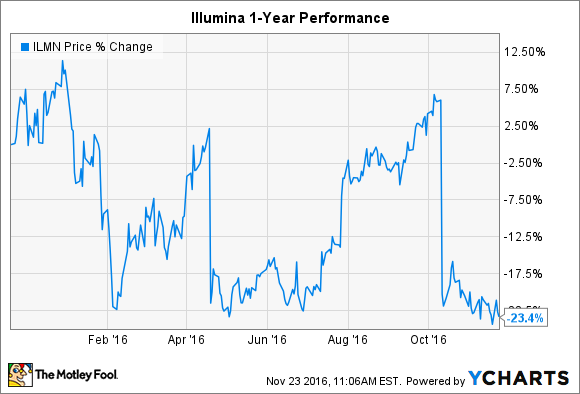 Investors should take a closer look at biotech stocks Illumina (NASDAQ:ILMN), Incyte (NASDAQ:INCY), and PAREXEL International (NASDAQ:PRXL), which present intriguing value at the moment. By traditional metrics, such as a price-to-earnings (P/E) ratio of 45, genomic sequencing powerhouse Illumina is not cheap. But that's actually one of the lowest ratios the stock has ever had, as seemingly perpetual high growth -- revenue and earnings per share (EPS) grew 93% and 177%, respectively, from 2012 to 2015 -- have made traditional metrics largely irrelevant in the last 10 years. However, last summer investors began to worry that the growth would stop, and volatility rolled in overnight. Illumina stock is down 45% since hitting all-time highs in July 2015 and down 23% in the last year. Investors were not impressed with third-quarter 2016 results, either. That's despite 10% growth in revenue, 21% growth in EPS, and a higher cash balance compared to the year-ago period. While full-year 2016 EPS will contract from last year's levels, it seems investors are being too near-sighted. Why? After laying the groundwork for a global DNA sequencing industry for the past decade, Illumina is now well positioned to capitalize on broader markets capable of leveraging cheap sequencing, such as early cancer detection and consumer genomics. It even launched two new companies this year -- GRAIL and Helix -- to take advantage of those exact trends. It's still too early to tell if they'll be successful, but if Illumina's crystal ball is working, then investors have a lot of future growth to look forward to. 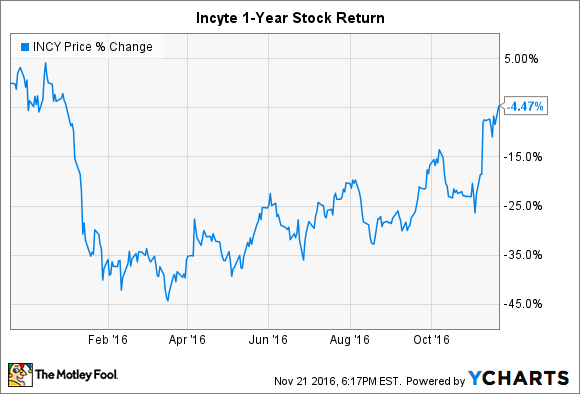 Investors may balk at the idea that Incyte stock is on sale, especially after a major run-up in the last month, but its fortunes have improved considerably after starting 2016 with a high-profile pipeline failure. The company's lead product, oncology drug Jakafi, has led top-line growth nearly 53% higher in the first nine months of this year compared to the same period of 2015. Better yet, the leading potential competitor in the industry's pipeline, momelotinib from Gilead Sciences, just failed to meet its primary endpoint in a phase 3 trial. That gives Incyte considerable breathing room moving forward. Incyte expects Jakafi's peak sales to reach $1.5 billion in the United States, up from an estimated $835 million by the end of this year. While the remainder of its pipeline is in relatively early stages, it contains an alphabet soup of high-interest checkpoint antibodies for oncology indications. A profitable blockbuster drug and potential-packed pipeline could make the company an intriguing acquisition target for a major pharma looking to stave off sales declines of top drugs or inject innovation into its own pipeline. Ironically, one company struggling with both of those issues is Gilead Sciences. Of course, it's never a good idea to buy a company purely on the hopes that it gets bought out, but the same features that make Incyte attractive to Big Pharma are the ones that should excite the individual investor. Parexel International may be relatively unknown to most investors, but the biopharma services provider dropped like a rock in October after announcing fiscal 2017 first-quarter earnings and again in mid-November after notifying the SEC that it found accounting errors in recent filings. That's always a red flag -- and it whacked $255 million off the company's market cap in a matter of hours -- but the errors appear to be relatively minor and genuine mistakes. Either way, the stock is down 16.5% in the last year as a result. The company noted exact figures for errors found in the most recent quarterly period but said it was still working to determine adjustments needed for prior periods. The good news is that the revenue adjustment only amounted to a drop of 1.2%. The bad news is that the EPS correction was 10.7% lower than originally reported values. 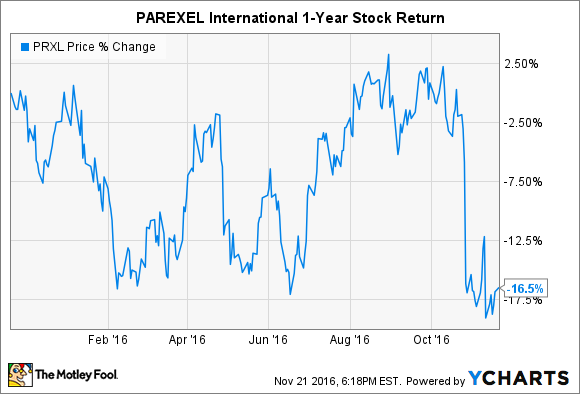 While investors are taking a cautious approach to the news, it seems likely that Parexel International will rebound if the errors in prior periods are also relatively minor. The biopharma services provider has maintained healthy profits for years, boasts a healthy balance sheet, and shouldn't encounter many long-term headwinds for growth. The list above demonstrates the importance of investigating companies beyond the headlines and the meaning interpreted from falling stock charts. Generic competition, a failed pipeline drug, and accounting errors can all be potentially worrisome news for investors, but news bombs like that also require further research. After a closer look, it appears that Illumina, Incyte, and Parexel International are biotech stocks to buy on sale.